Home > News > News > Three Awesome Fall Shows Just Announced! Three Awesome Fall Shows Just Announced! We’re super excited to tell you that three new shows have been added to this year’s schedule! 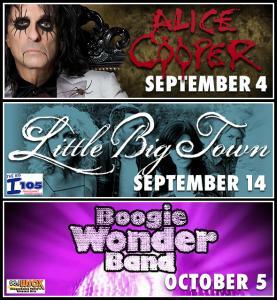 Alice Cooper, the “Dark Prince ofShock Rock” appears on September 4; country sensations Little Big Town hit the stage on September 14; and keeping ‘70s disco alive, it’s the Boogie Wonder Band on October 5. Tickets go on sale for all three shows on July 13 to AMT Members, and July 17 to the public. Get your tickets now for these and all the awesome upcoming shows at AMT – Where Music is Alive!